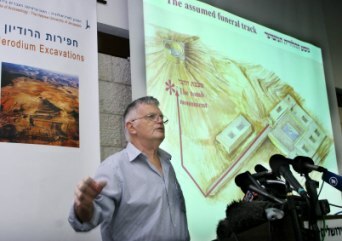 The long search for Herod the Great’s tomb has ended with the exposure of the remains of his grave, sarcophagus and mausoleum on Mount Herodium’s northeastern slope, Prof. Ehud Netzer of the Hebrew University of Jerusalem Institute of Archaeology announced today. Herod was the Roman-appointed king of Judea from 37 to 4 BCE, who was renowned for his many monumental building projects, including the reconstruction of the Temple in Jerusalem, the palace at Masada, as well as the complex at Herodium, 15 kilometers south of Jerusalem. .
Herodium is the most outstanding among King Herod’s building projects. This is the only site that carries his name and the site where he chose to be buried and to memorialize himself -- all of this with the integration of a huge, unique palace at the fringe of the desert, said Prof. Netzer. Therefore, he said, the exposure of his tomb becomes the climax of this site’s research. The approach to the burial site - which has been described by the archaeologists involved as one of the most striking finds in Israel in recent years - was via a monumental flight of stairs (6.5 meters wide) leading to the hillside that were especially constructed for the funeral procession. The excavations on the slope of the mountain, at whose top is the famed structure comprised of a palace, a fortress and a monument, commenced in August 2006. The expedition, on behalf of the Institute of Archaeology of the Hebrew University of Jerusalem, was conducted by Prof. Netzer, together with Yaakov Kalman and Roi Porath and with the participation of local Bedouins. The location and unique nature of the findings, as well as the historical record, leave no doubt that this was Herod’s burial site, said Prof. Netzer. The mausoleum itself was almost totally dismantled in ancient times. In its place remained only part of its well built podium, or base, built of large white ashlars (dressed stone) in a manner and size not previously revealed at Herodium. Among the many high quality architectural elements, mostly well decorated, which were spread among the ruins, is a group of decorated urns (made in the form of special jars that were used to store body ashes). Similar ones are to be found on the top of burial monuments in the Nabatean world. The urns had a triangular cover and were decorated on the sides. Spread among the ruins are pieces of a large, unique sarcophagus (close to 2.5 meters long), made of a Jerusalemite reddish limestone, which was decorated by rosettes. The sarcophagus had a triangular cover, which was decorated on its sides. This is assumed with certainty to be the sarcophagus of Herod. Only very few similar sarcophagi are known in the country and can be found only in elaborate tombs such as the famous one at the King’s Tomb on Selah a-Din Street in East Jerusalem. Although no inscriptions have been found yet at Herodium, neither on the sarcophagus nor in the building remains, these still might be found during the continuation of the dig. The search for Herod’s tomb, which actively began 30 years ago, focused until the middle of 2006 at Lower Herodium, in an area which was, no doubt, especially built for the funeral and burial of the king - the “Tomb Estate.” In order to reveal there the remains from Herod’s days, the expedition was “forced” to first expose a large complex of Byzantine structures (including a church), an effort that demanded many years of digging. The Tomb Estate included two monumental buildings and a large ritual bath (mikveh) as well as the large route (350 meters long and 30 meters wide) which was prepared for the funeral. When no sign of the burial place itself was found within the Tomb Estate, the expedition started to search for it on the slope of the hill, although there seems to be no doubt that the initial intention of the king was to be buried in the estate and that only in a later stage of his life - apparently when he grew old - did he change his mind and asked to be buried within the artificial cone which gave the hill of Herodium its current volcano-shape. “The king’s funeral next occupied his attention. Archelaus, omitting nothing that could contribute to its magnificence, brought forth all the royal ornaments to accompany the procession in honor of the deceased. The bier was of solid gold, studded with precious stones, and had a covering of purple, embroidered with various colors; on this lay the body enveloped in purple robe, a diadem encircling the head and surmounted by a crown of gold, the scepter beside his right hand. The enlargement of the park started in 1980; unfortunately the activity at the site stopped as a result of the first Intifada, but not before the complex of tunnels from the days of Bar-Kokhba, within the mount, were opened to the public. The archaeological excavations at the site, which also stopped in 1987, were renewed 10 years later and continued until 2000, and after a second break, were renewed at the end of 2005. Prof. Netzer gained his first “intimate” acknowledgement of Herodian architecture while joining Prof. Yigael Yadin (in 1963-66), in his expedition at Masada. Netzer’s Ph.D. dissertation in archaeology, guided by Prof. Yadin, brought him to initiate excavations both at Lower Herodium and at Jericho – at the complex of Hasmonean and Herodian Winter Palaces. (The site at Jericho, following Netzer’s excavations, includes three palaces of Herod and a hitherto unknown large complex of Hasmonean winter palaces). Additional Herodian structures in other parts of the country were also uncovered by him. He has written various books and articles on the topic of Herodian architecture. 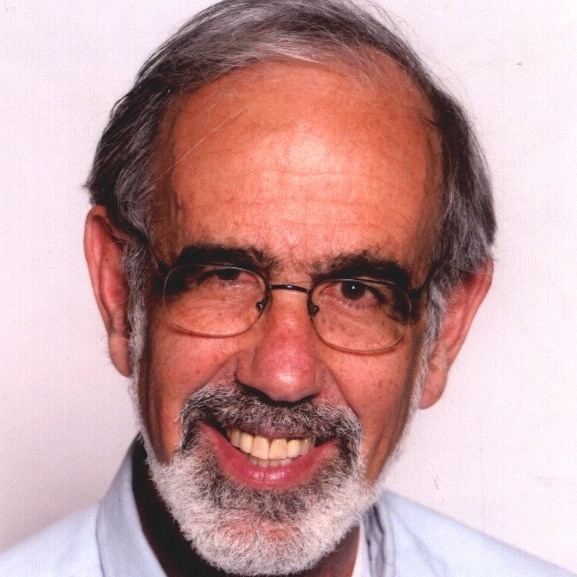 Yaakov Kalman, archaeologist and farmer, participated in many excavations throughout the country and took an active part in Netzer’s excavations at Masada, Jericho and Herodium. Roi Porath took an active part in the survey of the Judean Desert caves and has many significant finds in his record. The current excavations benefited from donations of private individuals, and the assistance of the Israel Exploration Society and the Israel Nature and Parks Authority. Photos of Herodium available via e-mail upon request.